Lorenzo Garcia, chairman of the Young Conservatives of Texas, announced the game will involve students tracking down other students tagged as "illegal immigrants" in exchange for $25 gift cards. Lorenzo Garcia and his chapter of the Young Conservatives of Texas are under fire for a controversial "catch an illegal immigrant game," which calls for students to apprehend people wearing "illegal immigrant" labels in exchange for $25 gift cards. Garcia posted a Facebook event for the "game" to be held on Wednesday, meant to increase awareness about illegal immigration. Texas Democratic Party Chairman Gilberto Hinojosa blasted Texas Attorney General Greg Abbott over the event because Garcia has been a staffer for him. "Greg Abbott has already put fear into the hearts of hardworking college students in Texas, through his refusal to take a real position on the Texas DREAM Act. While Abbott has said he doesn't support the DREAM Act as it is, he refuses to say what he would change and if he supports it at all. And now one of his staffers is organizing theatrical arrests on campus. Our young and promising DREAM Act scholars already live in enough fear of Abbott, without his staff also forcing them to watch mock arrests. This is an incredible shame. Greg Abbott owes Texas DREAM Act scholars an apology, and he must come out and immediately denounce Wednesday's event. This style of hatred and fear is not the type of leadership Texas deserves." Garcia, seen here with Abbott, spoke to BuzzFeed about how the event came about. "I've been thinking about the event for a while since President Obama said he wanted to pursue amnesty after health care," he said. He read on Drudge Report that "a Democratic congressman is on the record saying amnesty is the key for saving Obamacare." "It made me think about illegal immigration in general and how much they put into the system and how much they take. I thought it would be a good way to spark the debate at UT by having an event such as this." Abbott sought to distance himself from the event in a statement. "Our campaign has no affiliation with this repugnant effort," it read in part. "Illegal immigration and the failed policies of the Obama administration are no joking matter." Garcia addressed the idea that the event's wording of "catching illegal immigrants" could lead to safety concerns, saying that the only safety concerns he sees stem from the opposition to the event, which he believes could become violent. "There is no safety concern," Garcia said. "What’s going on is you go up to them and you present them a student ID and say, 'Hi, I’m here to take you in, immigration services.'" "It's not meant to be violent. We're not promoting violence, but I'm concerned the opposition will be violent either to the 'illegal immigrants' or to the people at the table." For this reason Garcia said he scheduled a meeting to speak to the university on Tuesday. The event is being blasted online. YCT is actually hosting a "catch the illegal immigrant game" and in result I may shoot myself because people are SO STUPID IT HURTS. Texas conservative college group to hold &lsquo;Catch An Illegal Immigrant&rsquo; game http://t.co/tLzEwhdyIU #timeisnow So infuriating. 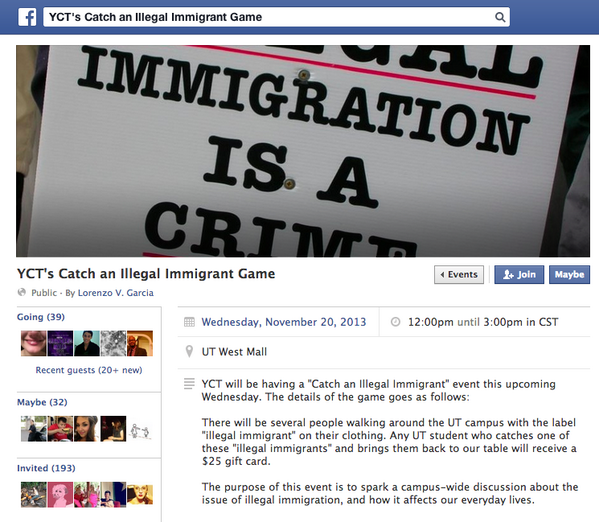 Texas conservative college group to hold â€˜Catch An Illegal Immigrantâ€™ game http://t.co/tLzEwhdyIU #timeisnow So infuriating. Abbott Backer Promotes "Catch An Illegal Immigrant" Game | Lone Star Project: http://t.co/E0udgAHCQF @lsptex Nice xenophobic voter appeal. The official account for the Democratic Party jumped in. Texas Congressman Joaquin Castro also sought to connect Garcia with Abbott and state GOP attitudes on immigration. “Texas Republicans are becoming more and more radical. This 'game' points to a growing anti-immigrant sentiment from within the Republican Party in Texas," he said in a statement to BuzzFeed. The Hispanic Communications Director for the RNC had a message for the Young Conservatives. Other conservative commenters on Twitter and the Facebook event chimed in as well. "This is not what Conservatives/Republicans stand for," wrote a conservative dissenter. "You are giving the Conservative ideology and Republican party such a bad representation. I just hope people don't judge the ideology and party as a whole for this mistake." "Anyone (especially left wingers) who thinks this is what Conservatives/Republicans stand for probably don't have the slightest clue what they are talking about," wrote another. Many are calling on the university to have the event canceled. Garcia said that he has worked for Texas Senator Ted Cruz as well as Abbott, but on policy and not concerning illegal immigration. Garcia, who is Mexican-American, addressed other Hispanics calling him an Uncle Tom. "They think if you are their race and don't agree with them you're an Uncle Tom, you're a racist," he said. "At least I stand up for my beliefs. I quote one of the founders, I'd rather die on my feet than live on my knees." As was the case with the YCT bake sale on the west mall last month, such tactics are inflammatory and demeaning. And once again in trying to be provocative, the YCT is contributing to an environment of exclusion and disrespect among our students, faculty and staff by sending the message that certain students do not belong on our campus. Some UT Austin students are undocumented, and under Dream Act legislation signed into law in 2001, these students are entitled to attend state universities. They are part of a growing diverse population on campus and in the state of Texas—a population that plays increasingly larger roles in our intellectual, economic, political and cultural communities. The university honor code entreats students to abide by the core values of the university, one of which is freedom, but two others of which are individual opportunity and responsibility. The university also values free speech and our campus continues to be an arena that inspires dialogue from diverse viewpoints. However, it is also meant to be a community where students exhibit respect for each other while holding those viewpoints. If the members of YCT carry out their plan for "Catch an Illegal Immigrant," they are willfully ignoring the honor code and contributing to the degradation of our campus culture. And once again, they will have resorted to exercising one of the university's core values to the detriment of others. Such actions are counterproductive to true dialogue on our campus, and it is unrepresentative of the ideals toward which our community strives. This isn't Garcia's first time courting controversy. An anti-affirmative action bake sale earlier in the fall included different prices for people of different races. The proposed YCT event is completely out of line with the values we espouse at The University of Texas at Austin. Our students, faculty and the entire university work hard both to promote diversity and engage in a respectful exchange of ideas. The Wednesday event does not reflect that approach or commitment. As Americans, we should always visualize our Statue of Liberty and remember that our country was built on the strength of immigration. Our nation continues to grapple with difficult questions surrounding immigration. I ask YCT to be part of that discussion but to find more productive and respectful ways to do so that do not demean their fellow students. While many joined the initial Facebook event to attack it and its creators, a counter event has sprung up with a much higher number of people participating. As of 4:30 p.m. ET, the original event has 219 people who have said they are attending. The counter event is up to 1,575.